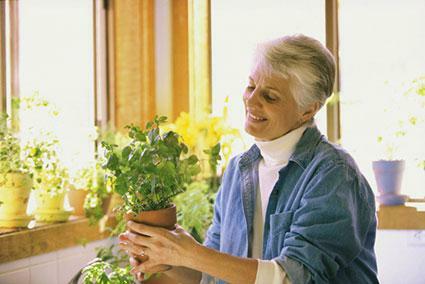 A bit of greenery inside the house improves indoor air quality and can lift spirits. Any part of the house that gets direct or indirect sun for about four or more hours can accommodate plants adapted to such conditions. With the advent of powerful artificial lighting, soilless growing media, and automatic watering systems, indoor gardening has come of age. Large, free-standing containers or built in planters can provide plenty of space for a mini garden in which different plants can cohabit. 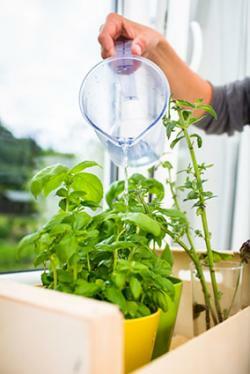 Indoor container gardening is one of the most popular ways to grow plants inside. The container can be metal, plastic or ceramic, or fabricated from concrete, but you need to duplicate everything else that Mother Nature provides to follow through with this technique. Light - Locate the containers in a sunny spot, such as a south-facing window or a sun room. Constructing a lean-to greenhouse against a large window or doorway will make it a well-lit extension to your indoor space. Watering - Water individual plants with a long-spouted watering can. If you forget to water, you might end up losing numerous plants at one go, not to mention the mess involved. Drip irrigation is the answer to this problem. Soil - A loose soil structure allows for good drainage and air circulation around the roots. Formulate the potting soil according to the specific needs of your plants. Herbaceous plants with fine roots do well in fine soil, but cacti and succulents need a gritty mix. Readymade potting mixes take the guesswork out of it. Temperature control - House plants generally thrive at 75 to 85 degrees. Although they can put up with lower temps, giving them extra heat can increase performance, which makes a difference with vegetables. Heating pads inside the containers can provide extra warmth to the root zone of the plants. Growing maximum plants in minimum space is the impetus behind vertical gardening, which is also a form of container gardening. Ornamentals or vegetable seedlings are planted in containers that can be stacked or hooked onto a frame. Indoor walls that receive good amount of sunlight can be the backdrop of vertical gardens, or grow lights can be used. Vertical gardens are usually watered by drip irrigation or a wicking system incorporated into the design. 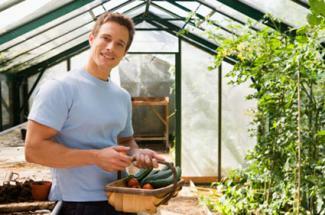 Another form of indoor gardening is greenhouse gardening. There are numerous types of greenhouses that you might consider building, depending on your needs and budget. Greenhouse designs range from the very simple to the elaborate and greenhouses can work through a temperature control system or solely on the heat from the sun. If you can get the conditions just right, you can enjoy year round gardening in your greenhouse. Growing plants indoors without soil is a method which is gaining more and more momentum. Water culture - In the simplest of hydroponics systems called water culture, the plants are in individual containers or large trays filled with an inert medium. They are then immersed in a larger container filled with nutrient solution. An air pump is used to create bubbles in the solution so that the roots get aerated. Drip system and ebb and flow method - The nutrient solution is circulated through the growing media with the help of a pump, in a continuous drip or intermittently. This helps reduce chemical buildup in the medium and affords more aeration to the root system. Nutrient film technique - In the Nutrient Film Technique (NFT), the medium is done away with. The plants are inserted into holes on a PVC tube and their roots are allowed to dangle into the nutrient solution flowing through the tube. Aerophonics - Aeroponics is a variation of variation of hydroponics where both growing medium and flowing water are absent is known as aeroponics. The nutrient solution is sprayed onto the roots of the plants with a mister. It provides excellent aeration for the roots, which, in turn, gets translated into vigorous growth. The best hydrophionic plants to grow include vegetables that taste best when hand-picked like lettuce, tomatoes, herbs, and spring onions. However, root vegetables will not grow well in this type of garden setting. Tower gardening is a vertical garden incorporating the principles of either hydroponics or aeroponics. The main structure is a vertical column filled with a growing medium, and with pockets on all sides for planting seedlings. The nutrient solution is dripped into medium either continuously or intermittently. Some ready-to-use grow towers use no medium. Hydroponic solution is sprayed onto the roots inside the column instead. The water from the fish tank, which contains the nitrogenous waste products, is channeled to the hydroponic tray containing plants growing in a medium. The plant roots absorb the nutrients and the medium filters out solid particles. The water is then returned to the fish tank. 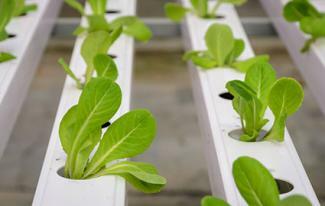 The working of the aquaponics system may appear as simple and straightforward, but it is rather complex. The majority of the cleaning process is carried out by microorganisms that colonize the growing media. They break down the solid waste into simpler compounds that can be utilized by the plants. The recirculation of water makes aquaponics eco-friendly and cost-effective. 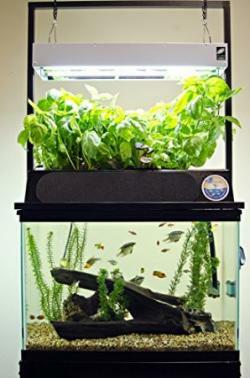 In a simple system, the plant container is stacked on top of the fish tank. Whether indoors or outdoors, an aquaponics system should be located where the plants get plenty of sunlight or artificial light. Be sure to become familiar with the best plants to grow in this type of system, like vegetables such as beans, carrots, and lettuce, before investing time and money. Maintaining an indoor garden is highly rewarding. However, some precautions like protecting the floors and nearby walls with waterproof coating or rubber mats should be taken.